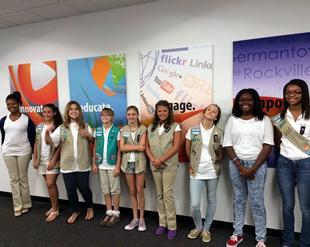 Girl Scouts from Troop 4582 were excited to compete! Association 31 of Girl Scout Council of the Nation’s Capital held a cupcake challenge on March 25, 2017 to earn money for SHARE. 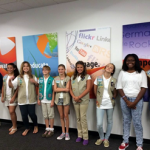 SHARE is the giving campaign for GSCNC that raises funding for improving Girl Scout camps, financial assistance, and supporting programs. One of the many entries in the challenge. The challenge for the Girl Scouts competing the cupcake challenge was to decorate twelve cupcakes to represent the theme of “100 years of Cookies”. 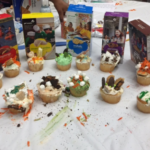 Troops were given plain cupcakes, a tub of frosting and a mystery ingredient that had to be used in their decorations. The mystery ingredient this year was shredded carrots. They could bring any additional decorations and things for their display that they wanted. Each troop entering the competition also brought a donation to SHARE. 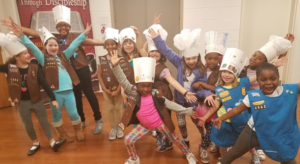 Girls Scouts from Kindergarten to 8th grade participated. 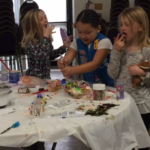 These Daisies enjoyed snacking while decorating! 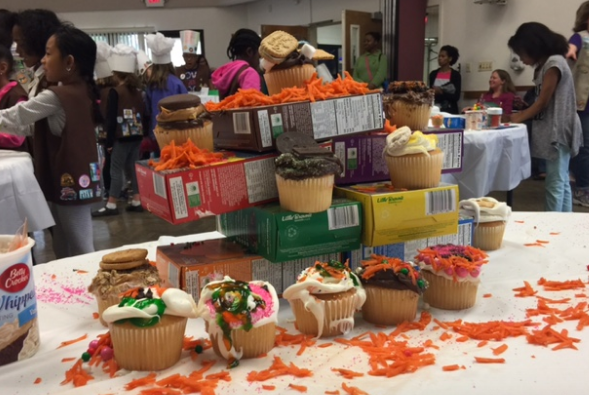 Another creative display of cupcakes. The event earned over $560 for SHARE!